I'm not sure who in their right mind tells their adoring discerning readers that they may want to unsubscribe but it's no secret that I am not usually in my right mind. The left, maybe. But never the right. Why else would I go knocking on Amy's door reminding her that October 1 is right around the corner and that means...pshaw! you guessed wrong! That's on October 2. No, October 1 heralds the dawn of NaBloWriMo. Thanks to the power of Twitter, we have more than 30 bloggers this year! What? You aren't on Twitter yet? I've had an account for a very long time but I became active only when I discovered the power of Twitter during the Mumbai bomb blasts last November. I kept up with the BlogHer Food Conference that way, too. Did you know that they served frozen pasta for lunch? To food bloggers? Most of whom care about the ingredients they use? And some of them even make their own pasta? I don't care much for the noise on Twitter and I find the brown nosing rather repulsive although it can provide comic relief on long days! I am grateful for Tweetdeck which allows me to file the noisy ones away into a column which can be read at will or ignored at will. My tweets cannot be classified as pearls of wisdom but if you want to follow me, feel free to do so. 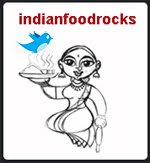 I don't follow everyone who follows me so if you want me to see your tweet, please use @indianfoodrocks cos I generally keep an eye on mentions. But, please don't spam me cos that is something I detest even more than brown nosing and noise. Back to the subject of unsubscribing: the theme (as if there was one) changes dramatically here at Indian Food Rocks during NaBloWriMo. Anything is fair game during NaBloWriMo: be it a recipe, a picture, a video, an offbeat story, a picture of me - yeah, anything. This might not appeal to my more serious readers or readers who want recipes instead of my drivel. But here's a plea, if you do unsubscribe, do come back once in a while to get some IFR cookies for your starving browser and re-subscribe in November. Manisha, I had no clue about NaBloWriMom. Will try to remember next year. Not unsubscribing, just yet. Will keep coming back for the daily dose. This is my first year participating with NaBloWriMo. I'm excited!!! Nervous... Just don't know if I have enough words to post 31 in a month. Lol. Mine will be short posts for sure but it will be something! Well, I'll be back to see what you come up with each day. I'm taking part again this year in NaBloWriMo, too. And I'm on twitter (@MermaidHel). And, I have no idea what to do with Twitter (and why, or how)...very much the laggard there. Are you out of your mind?..who will unsubscribe you think..be warned many will come back to read your daily dose of drivel! btw that twitter logo with IFR looks so cute!